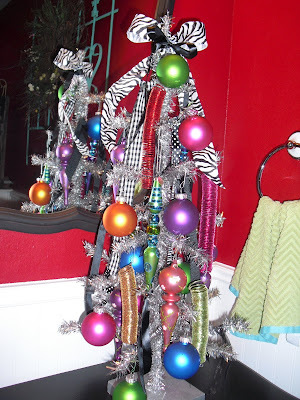 Kellys Korner is hosting "Show Us Your Christmas Trees"! This is my Santa tree in my living room. I almost never do my trees the same year to year. This year I added some turquoise ornaments. And my tree topper is really an ornament. I just screwed the top off and shoved it on the top branch. I think kitchen ornaments are the most fun! 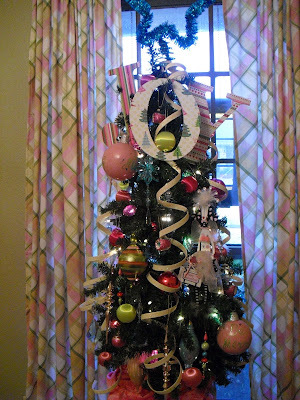 It's just hard to see with all the ribbons and ornaments piled on top. My sister has a cricut and made me some polka dots to stick on some of my ornaments! You should tell your sister to get a cricut too! I think Santa should bring extra presents to put under all my extra trees! Wow you’ve been a busy lady and all your hard work has paid off. Your trees are LOVELY, every single one of them!!!! I agree you deserve extra presents this year! I wish I had your creativity! You make me want to put a tree in every room of my house. Love them all! I love every single one of them!!! You are amazing. Please come over and decorate my house! love love love your trees and your christmas spirit!! 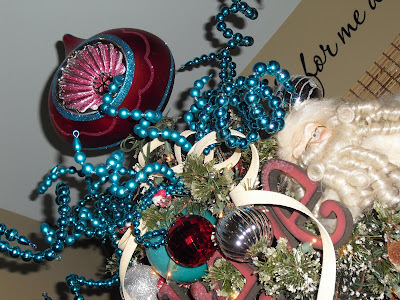 some favs: bathroom tree... "joy" on the pink room tree...and the fire man's hat tree topper!! Thanks for posting all the trees. I am trying to get my house decorated right now! I love the Cricut polka-dotted bulbs! How creative. I am so honored to have my bucket in the pink room. I loved looking at your Christmas trees. They are gorgeous! I KNEW you would have the best Christmas decorations and you did NOT disappoint! I lost count how many trees you had but I loved them all! Loved the kitchen one with cokes on it! That's my kind of tree!!! P.S. I'm praying that one day soon you will have a hard time decorating because you've got a little mini me under your feet too! I esp love your kitchen tree and your den tree! Yours puts mine to shame!! Maybe I'll have more inspiration next year! Thanks! I LOVE your decorations. I especially like the bright turquoise blue decorations. Love all of them. Seriously Dina...I want to move in. I'll bring Coke cans that aren't empty!! I love all your trees!! I really love the coca- cola one! Too cute!! I love all of your trees especially the kitchen one! Great job! Your trees are so cute! 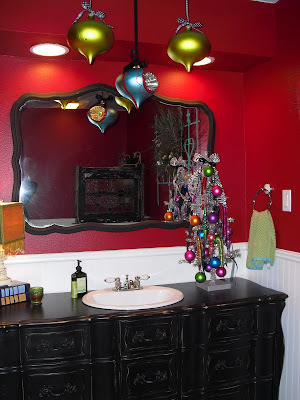 I love all the ornaments you have dangling from the ceilings...GREAT idea!!! You are a true artist! I love your fun, artsy decor! Amazing and very inspiring! OMG!! I love your house, but your Christas decor is just FAB! So cute makes me feel like a super slacker LOL!! I found you on another "Show us your life" through Kelly's Korner and started following you a while ago. I just LOVE your style! I think my fav. tree would be your kitchen tree as well! I think I may have to "borrow" your coke can idea for next year! We have a small fireman tree as well. My son LOVES firetrucks. I am now on the lookout for a fireman santa! I have to tell you that I want to be friends with you - your blog is on my daily "check" list and I love everything about your style and decor! 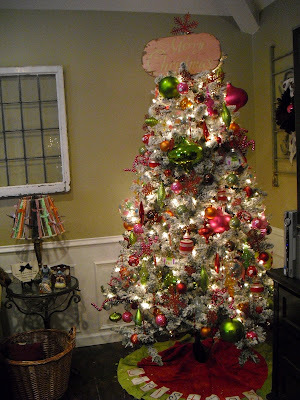 I love your Christmas trees and how absolutely adorable they are! Way to go!!! Love all of your trees!!! OMG I'm in love. Your house is gorg, your trees are fab and you make me smile. I don't have a sister to tell to get a cricut...so I'm going to ask Santa. Ciao! I love all your pictures!!! PRECIOUS!! 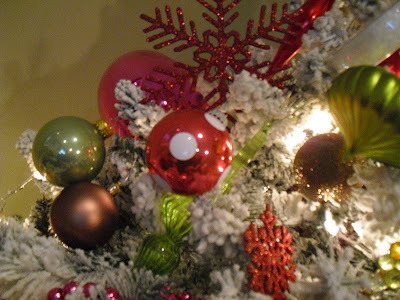 I have a Cricut and I would love a tutorial on the polka dot ornaments!! They look so smooth!! Again I love it! I love your trees! They are all so cute and fun! 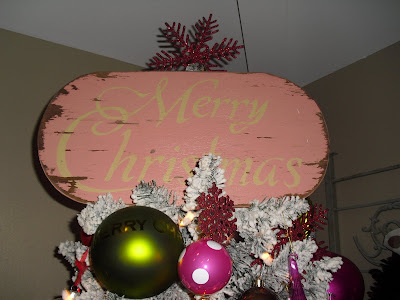 I really liked the pink Merry Christmas plaque on the one tree. Merry Christmas! 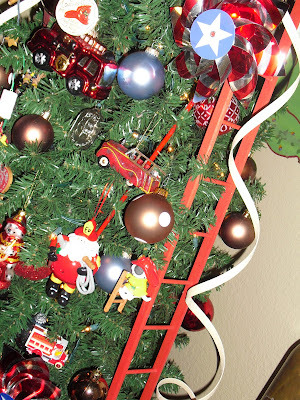 The fireman tree and the kitchen tree are my favorites! Everything is so pretty. your trees look great! i love the big "joy" ornaments! Love love love your trees and they all look great! 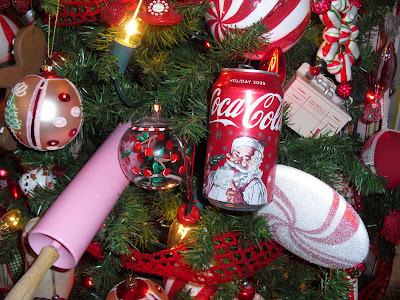 Your coke can tree is adorable! You are so creative! I agree Santa needs to bring extra gifts to your house. Your trees are adorable! I love them! I just came over from Kelly's Korner to look at your trees! They are beautiful and so is your house!!! Wow! I love all of your trees. So creative! SOOOO cute!!!!! Your the best! GORGEOUS! Oh my goodness- I love every one of them, love every detail, love how unique they are! Thank you for sharing them for us to enjoy! 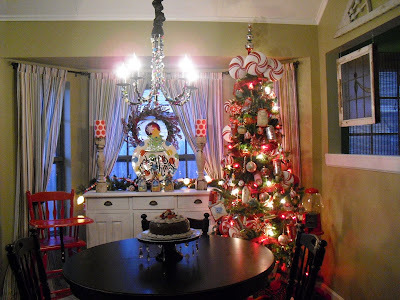 BEST Christmas trees and holiday decor. 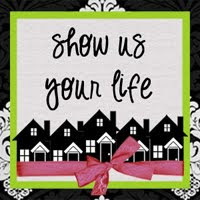 Seriously your home should be in a holiday home tour. 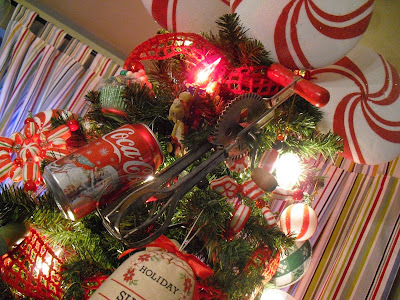 I am so in L-O-V-E with your Kitchen Christmas Tree ... it's so gorgeous and vintagy & Love the Coca Cola can ornaments ... what a great idea!!! I love all your trees!!! I wish I could talk my husband into a tree in every room!!! Stopping in from Kelly's blog. Your trees are all soo stinkin' adorable. I want to redo mine and add a few now! I especially like the one in the Kitchen, so cute! WOW!! Love all your trees!!!! WOW!!!! 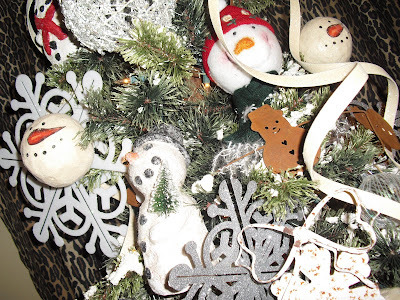 I love all of them, but my favorite is the snowmen tree. Oh my gosh, I love your taste. I am the nick nack queen of my family. I live in a very small apt but I take full advantage of every spot. hah Your home is so warm. It is so inviting. All the trees are beautiful but the white tree with snow is spectacular my favorite. Your trees are beautiful! I love them! The fireman one is my favorite. 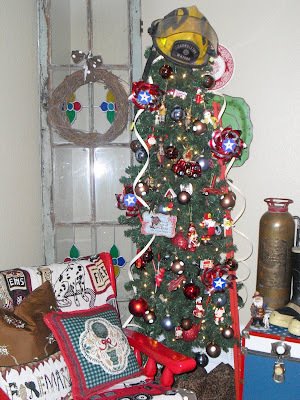 My husband is a police officer and I have wanted to do a police tree, but we don't have enough room for another one right now. (Already have 10!) Your trees have inspired me to fill my up a little more though. Love how yours are so full. Incredible! I would say, "oh that is my fave" and then I would see another picture...they are all gorgeous!!! Christmas blessings to you! You never cease to amaze me with all of your color and whimsy. I just love all of your trees and decorations. Good grief girl, have you been buying ornaments for years now? Please tell your secret of collecting. You rock sister, I NEED you to come help embellish my home...I'm having TWO parties this week...ACK, eeee! I love all of your trees!! They are AWESOME!!!! Love them, they look gorgeous! All your trees are just beautiful. 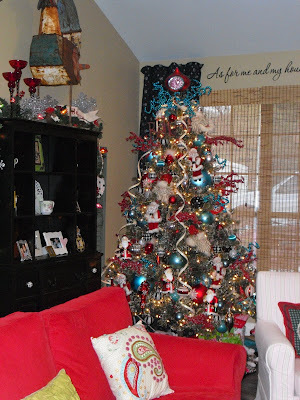 I love the Turquoise ornaments you added to the tree too! I totally have a *girl* crush on you with all your trees. They are absolutely beautiful and now I'm going to start thinking of different trees for my home. Hi Dina- I just had to leave a comment. I have been spending alot of time this morning enjoying your blog. I had every intention of getting up to clean....I thought it would be a perfect morning for that since we went to church last night. But you can see how that is going. 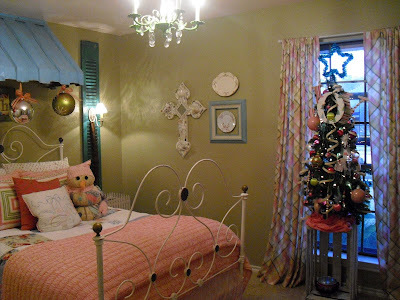 I love your decorating and your blog. I live an hour west of Chicago. But I have an itch to move to the Dallas area. My husband was pretty close to getting on a fire department near there. But since he is not yet a paramedic it hurt his chances. So he is currently a fireman in Iraq on a milatary base. You also started the itch in my to start a blog back up. OMG, I love each and every one of your trees, I can't possibly pick a favorite. You have been a busy lady and certainly deserve extra presents (or at least a back massage) this year! love the trees. just love them. really. so darn cute. did i mention that i loved your trees?? LOVE them! I love your trees! 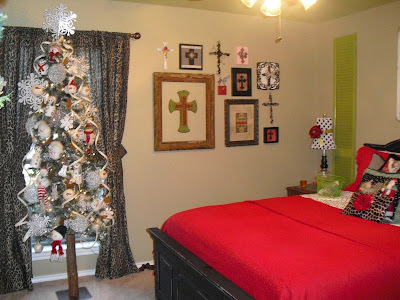 I had to go back and look through your blog because your decorating caught my eye! Such a beautiful home! Where did you get your red ladder?? Trees are very pretty!